Penn’s Phi Phi chapter was established on 27 September 1875 and appeared in The Record of that year. The national organization was founded in 1855 at Miami University in Oxford, Ohio. The Upsilon chapter disbanded (“stepped out”) in the 1877-78 academic year and was dropped from . 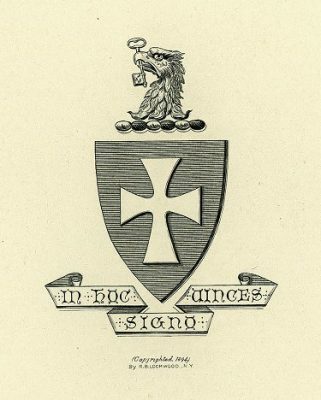 Twenty years later the Phi Phi chapter was established at Penn and Sigma Chi re-appeared in The Record of 1896. It remains active at Penn in 2003. Sigma Chi was the third national fraternity founded at Miami University, in Oxford, Ohio. It followed Beta Theta Pi (1839) and Phi Delta Theta (1848), but its birth was far more difficult than either of its predecessors. In June 1855, six men – Thomas Cowan Bell, James Parks Caldwell, Daniel William Cooper, Isaac M. Jordan, William Lewis Lockwood, Ben Platt Runkle, and Frank Howard Scobey – withdrew from the Miami chapter of Delta Kappa Epsilon and formed a new fraternity which they named Sigma Phi. In January 1856, however, members of a rival fraternity stole Sigma Phi’s ritual and other private records, which required the founders to re-name their organization and adopt a new constitution, bylaws, and ritual. Sigma Chi emerged from this ordeal and soon flourished, with twelve chapters in existence by the time of the Civil War. In 1875, twelve Penn students formed Sigma Chi’s Phi Phi chapter. They were drawn nearly equally from the College, Law School, and School of Medicine. They included William Burling Abbey (LL. B. 1876), Simon D. Addis (M.D. 1875), Cicero Brodhead (M.D. 1875), Frank Eyre (Class of 1875; M.D. 1875), Walter Lowrie Finley (Class of 1877), James Milo Giddings (M.D. 1875), Isaac Newton Gordon (Class of 1877), Dwight Morris Lowrie (LL.B. 1875), Henry Albert Potter (Class of 1877), Earl Milton Wilkins Seitz (Class of 1877), Amos R. Shalkop, and Joseph Warner Yardley (A.B. 1877). The founders of the Phi Phi chapter did not recruit well, however, and when the Class of 1877 left campus, the chapter essentially disbanded. For nearly twenty years Sigma Chi was not represented among Penn’s fraternities. 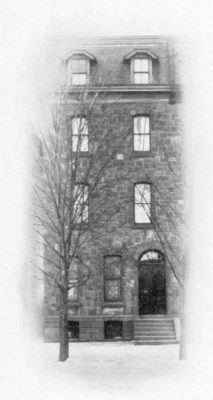 Then, in May 1893, a Philadelphia alumni chapter was organized and in May 1896 fifteen students, assisted by five alumni members, re-organized the Phi Phi chapter. By 1905 the Phi Phi chapter was renting a house at 3311 Walnut Street, before locating at 3604 Walnut Street. 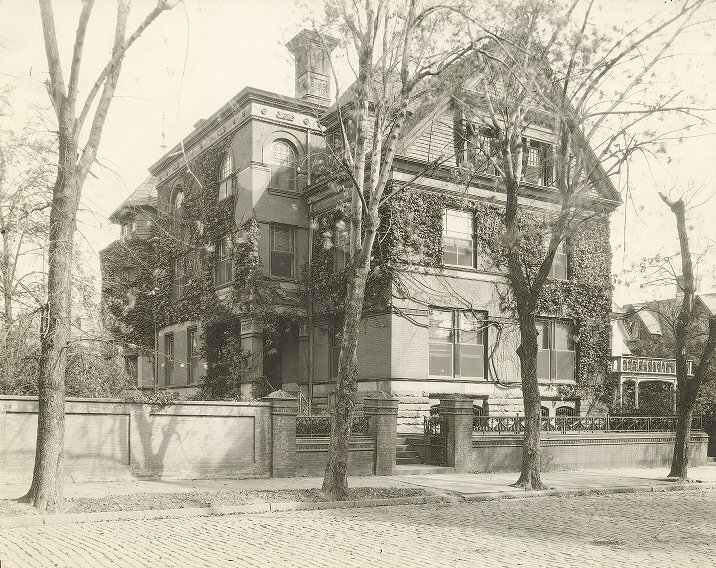 In 1928 Sigma Chi took possession of the Anthony J. Drexel, Jr. House at 3809 Locust Walk and has remained in that great brick mansion to the present time. The 1940 edition of The Record stated that Sigma Chi, Phi Delta Theta, and Beta Theta Pi formed “the famous Miami Triad,” a reference to the Ohio university where each was born. Historians of American fraternities often compare the significance of the Miami Triad to the “Triad” of fraternities that formed at Union College in the mid 1820s. By 1940 Sigma Chi had ninety-seven active chapters and the national organization published two magazines. Penn’s Phi Phi chapter published its own magazine, “The Quaker Sig” at the close of each academic year.